How can I register my pack on the site? This is a work of extreme importance. You and your tribe should be active. To be an official tribe you must put in your form the tribe name, alphas, introduction, description of the territory, den image (include description of the place, preys and predators that are found there) and the activity (1-10). 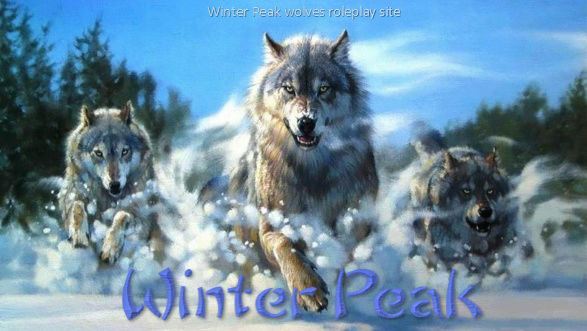 Post your form in 'Join Winter Peak'. After it be accepted these informations will be placed in 'Tribes, Sub-tribes and Groups' forum. Allies or rivals packs of Sakura Tribe are known as sub-tribes or groups. To be an ally or rival, you must join in the site as a sub-tribe or group. You should put in your form the pack name, leaders, site, if you are a ally or a rival and reason. Post your form in 'Join Winter Peak'. After it be accepted these informations will be placed in 'Tribes, Sub-tribes and Groups' forum. Someday you and your pack will be invited to roleplay with us here.